This week, on the blog, is all about the humble stocking. We start off this mini series with the ideal toddler Christmas stocking. Toddlers can be quite hard to fill stockings for. Most typical stocking fillers aren’t suitable for the under 3’s due to small parts but I think I have put together an ideal stocking, with items small enough to fit, yet large enough not to be a hazard. They are also fun too! It can be quite hard to get Christmassy items suitable for the younger ones. These give the perfect little festive touch for a toddler’s Christmas stocking and if you wrap them individually that’s 3 toys your child can rip open! With moveable arms and legs that make a clicketty clacking noise these little figures are the perfect size to be carried around by the smallest of hands. Christmas socks add that little bit of fun while keeping our feet snuggly warm. Adding a pair of festive socks to your toddler’s stocking means they don’t get to miss out on the fun. Although they may get soggy toes if they decide to have a chew on them before they even get on their feet! This three piece jigsaw is perfectly chunky for little hands to get a good grip. It is a simple jigsaw and will help improve coordination for even the youngest of toddlers while still being fun. I just love the little baby penguin at the bottom. This is bound to be a winner for any little boy or girl and is the perfect size for a stocking. These crayons are great from little ones as are used in the bath so they can get as creative as they like over the tub, the tiles, even themselves and it just washes right off! I remember the first version of these we had for E&Ff, about a decade ago, used to stain. Luckily the newer versions are much better! After all the excitement of present opening, sometimes we all need a bit of downtime to chill out a little. This little foam craft kit is ideal for a bit of quiet time together. Toddlers love to stick things and once these trees are decorated they can be put together and brought out year after year. Even the youngest members of the family deserve a little treat at Christmas and chocolate coins are the perfect, and traditional thing. O is lactose intolerant so Santa will be buying him these dairy free chocolate disks from Sainsburys. No stocking would be perfect without the obligatory Satsuma stuck right down into the toe. Of course I’m sure Santa would overlook any temper tantrums and not put a lump of coal in there instead! 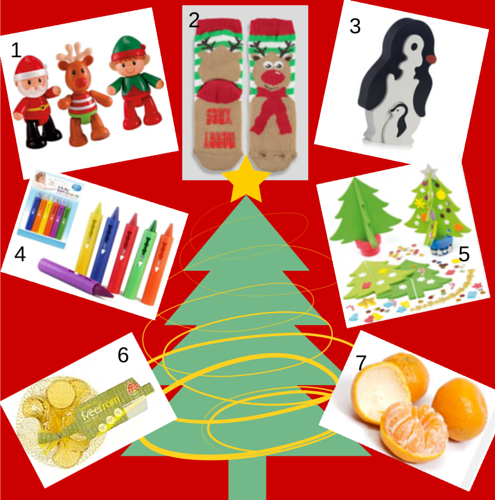 What will you be putting in your toddler’s Christmas stocking?